Leaving to hunt with Three Fingers today. Will be leaving from North Carolina at about 6pm and will have a 12 hour drive down. I will be visiting friends and will actually be hunting Sept 21-23. I'll keep everyone posted and hope to have some pictures to put up. soon as i get some time or know when i may have some time off work im going to book with them as well ,, good luck pics when you can ! Good luck. I'll be waiting for the write up. Drive safe. We arrived in Texas Sunday morning and will be heading out to hunt wednesday thru friday. I will keep you posted. Can't wait to see some pics. Good luck! update after the morning hunt. I believe you said Wed right? Good luck. 1st Morning hunt recap... I met up with Ryan this morning and headed out to a box blind at the back of the ranch. It was still dark and Ryan loaded the feeder with some corn and put some on the ground as well. I settled in and got my bow and camera set up. After about 10 minutes hogs and some other animals could be seen by the moonlight at the feeder. Light grew and I notice a few fallow deer, a red stag, and several hogs at the feeder. I wanted to shoot a hog but it was so early in the morning I held out for a while. Several big fallow bucks came in along with some whitetail does. After about 20 more minutes I could not wait any longer a nice 60 lb. hog presented a clear shot and I sent an arrow on its way. The shot was perfect and was accented by the lumenok. 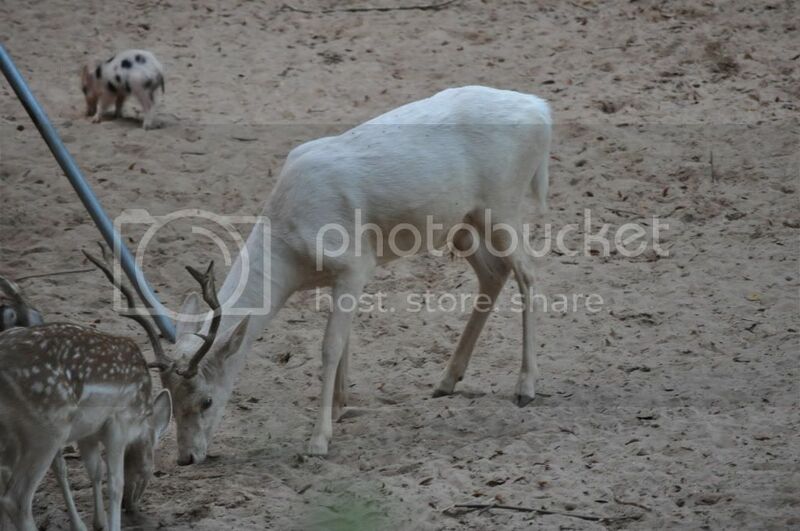 An oryx that I was after came in 4 times but would not commit to the feeder because of all the other animals. Ryan met up with me and we trailed the hog about 25 yards to its final resting place. The video of the hunt and kill turned out great. I will post the video when I get home this Saturday. I will be going out this weekend with hopes of the big oryx or a big sika. Good going! I look forward to seeing the Oryx or sika, when you connect. Yesterday was a good evening. I will do a write up at lunch. I'm back in the blind this morning. 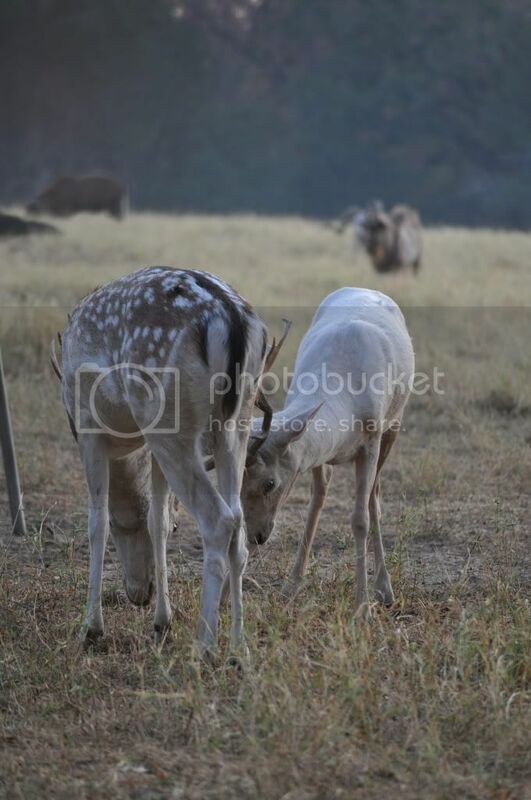 Havve you seen many blackbucks? Congrats on the hog. If you see that big Sika with a limp tell him hello. My brother gave him that limp. He's still PO'ed that it didn't drop him. He's a phenominal Sika. Keep us posted. Hoping to go back in November. Got back out to the stand yesterday evening about 5:45. I went back to the same stand as the morning in hopes that the big oryx I had seen the morning before would come in. About 6:30 a large group of rams came in. 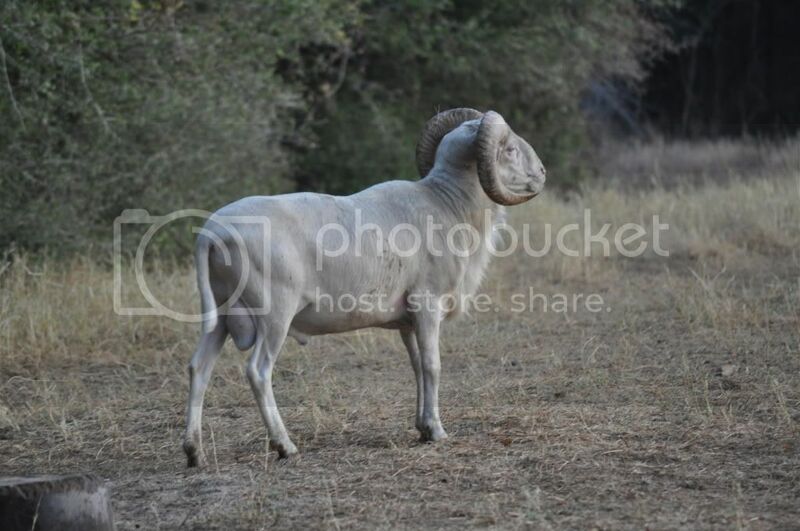 There were several big rams in the group included 2 huge dalls and a great corsican. I let the rams pass in hopes of the oryx. About 7:00 a big oryx appeared in the field about 200 yards out. He fed safely out of range for the next 25 minutes. With the oryx out of sight I caught movement of a big sika buck coming across the field to join up with the fallow in front of me. He was huge. I turned on the camera and prepare for the shot. I sent the arrow on its way. At thrity yards the arrow entered perfectly behind the shoulder. The sika made it 70 yards and was stone dead in the field. And Ryan I told limpy hello with a rage. He's huge man. 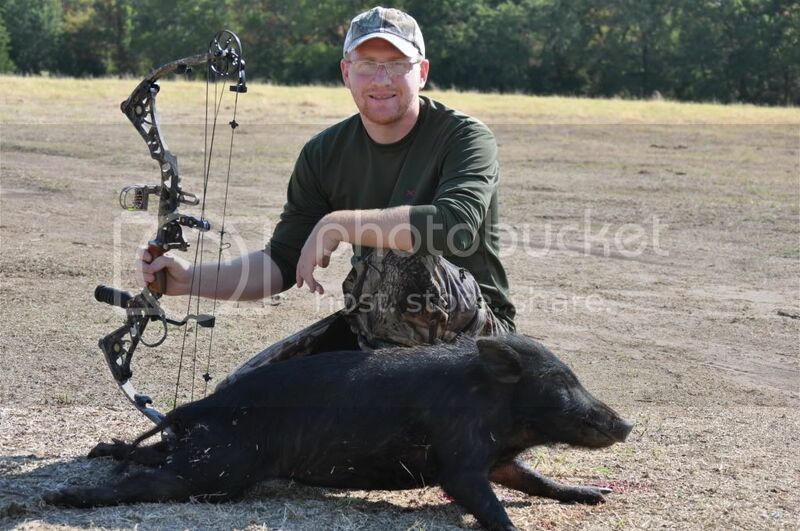 This is the hog I shot yesterday Morning. Fallow deer from yesterday morning. 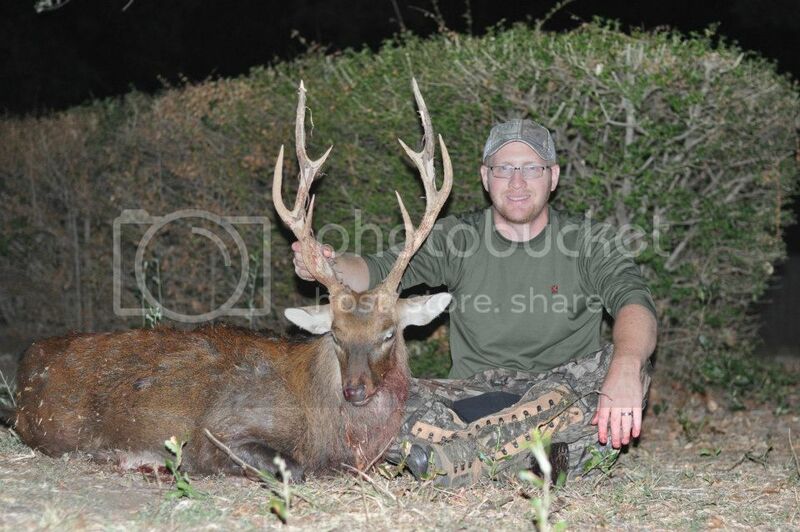 The Sika buck I shot yesterday evening. Congratst hat is a great sika I watched him limp around in front of me for 30 minutes great of you to put him out of his misery . I shot a big dall out there few months ago. Its crazy how that big group of ram comes in together and anilates all the corn, and they smell horrible when they all come in too lol. 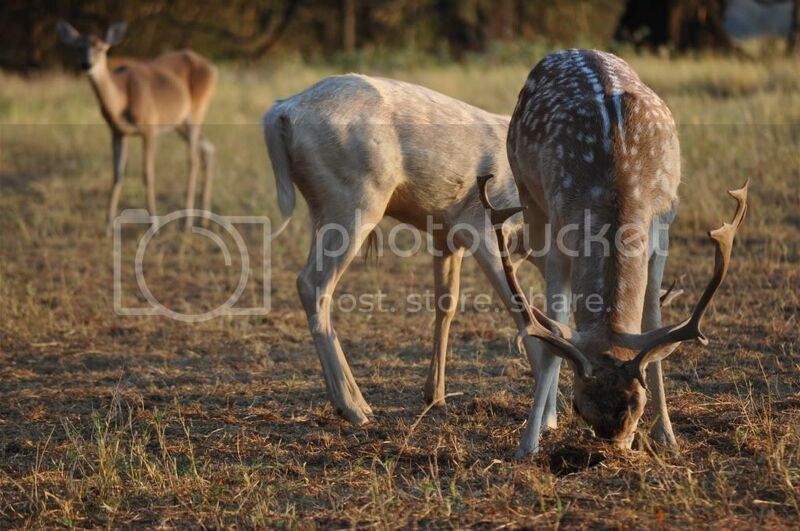 I saw two blackbuck bucks driving in. They were not very big. One is probably 8 inches and the other is 12 inches or so. Congrats. He's been limping around since July 29th. He truly is a trophy. Is the other one still out there? There were two of them, both very nice, but one noticeably bigger. That's great. I really do enjoy this place. Can't wait to get back. There are several sika bucks out there but there was only two big ones. This one looked to be the biggest. No kills this morning but I still saw lots of animals. Passed the rams again in hopes the oryx would come to the feeder. He did not. Ryan and I built a blind after the morning hunt on the other side of the field where the oryx likes to hang out. I am hoping he will come by within range. Don't be shy, that oryx looks like an absolute beast. Hunt In: Any where I can! Sorry guys for the delay. Thursday Morning was full of action as fallow hogs audad and rams came in and fed. As usually the big oryx stayed safely out of bow range by over a hundred yards. I passed on the hogs hoping the oryx would come in but to no avail. After the morning hunt Ryan and I move 200 yards across the field to where the oryx had been feeding the evening before. We built a ground blind and would return in the evening. I settled in the blind around 4:30 and had several whitetail does and 2 fallow bucks come to within 35 yards. Around 6:00 I saw two oryx horns coming up over the hill straight toward me. I moved lower in the blind and turned on my video camera. 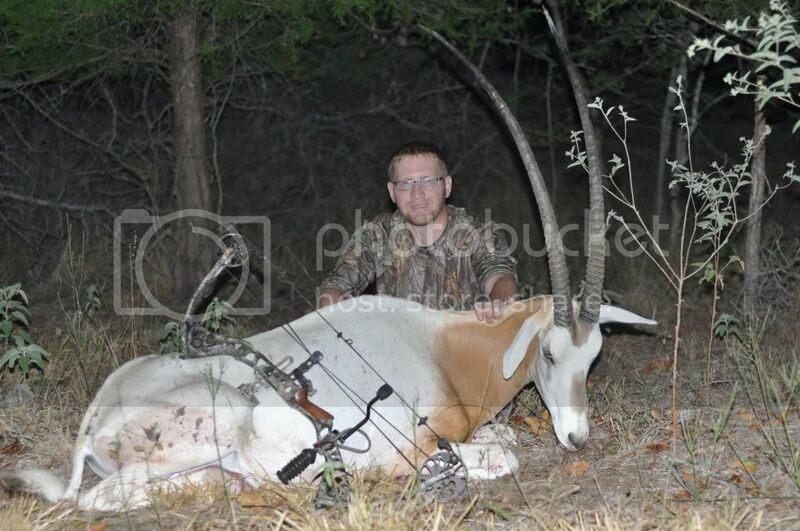 The oryx causously made his way to 35 yards and turned broadside. I drew and settled the pin center on his chest and released. I am not sure what happened but the arrow was way low and slightly back. Blood was immediantly visable but I knew the shot was not a good one. The oryx stopped at 70 yards in the field, I quickly nocked another arrow and settled my 60 yard pin a little high. The shot struck him low in the shoulder and with the quartering to angle looked to be perfect. We gave him 1 hours and found him about 200 yards from the second shot. He is absolutely huge. 37 1/2 inches on both sides with 7 inch bases. man those are two awesome trophies! That looks like an awesome hunt, congrats. congrats. You have definitely put some great animals on the ground. Man thats a great trip! Kudos to you!!! Congrats man, you have put down some incredible animals. Thanks guys. I have friday mornings hunt to report on. I will post about it shortly. After a late night of skinning quartering and caping the oryx. Friday morning came early. I met up with Ryan at 6am and we decide to try a different ladder stand inside the woods. 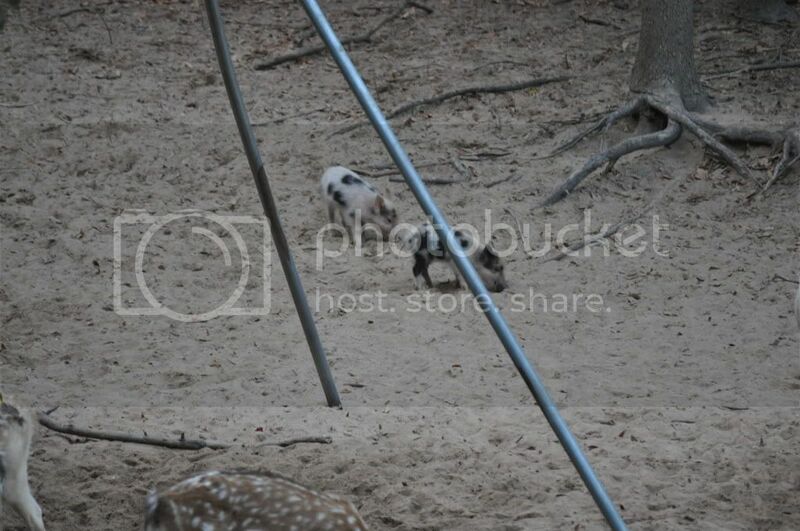 After getting set up I had several fallow deer and a group of five 40-100lb hogs to come into the feeder. I held out for a shot at the largest spotted hog and the shot never presented itself. the hogs left. About an hour later 3 piglets came in with the smallest hog of the previous group. I decided to take the shot. 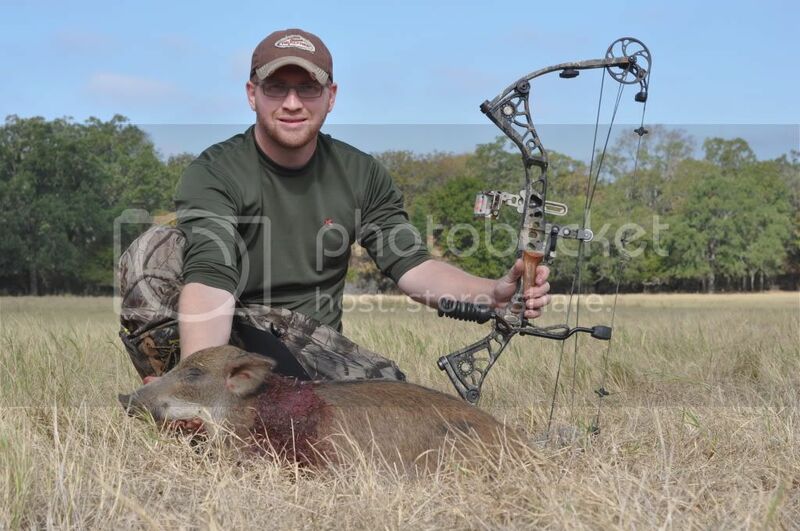 At 25 yards the shot was perfect and the hog dropped immediantly. With the feeder cleared out I waited for an hour and noticed a large herd of rams moving across the nearby field about 400 yards away. I got down moved the hog to some shade. 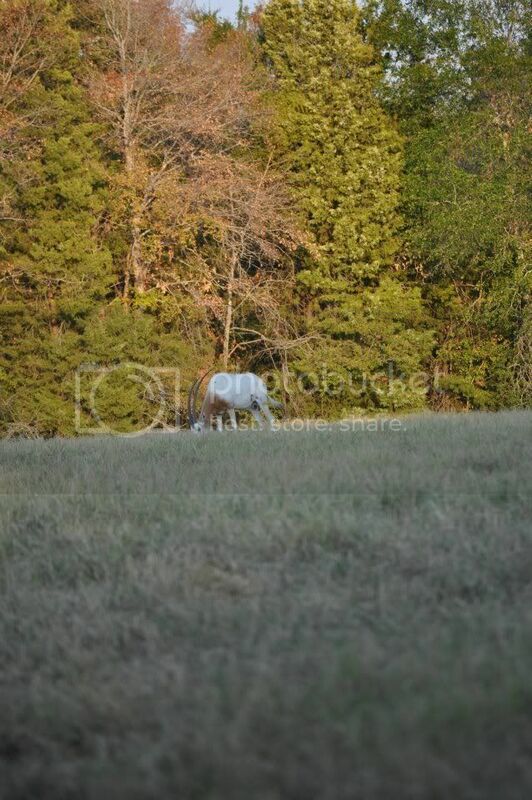 Grabbed my bow, camera and tripod and decided to try a stalk. around 45 minutes later and after about 600 yards I finally got in range of the majority of the herd. Two large dalls were near the back and I struggled to determine the biggest. One seemed to be much longer and wider, the other was heavier and tighter but seemed to be several inches shorter. 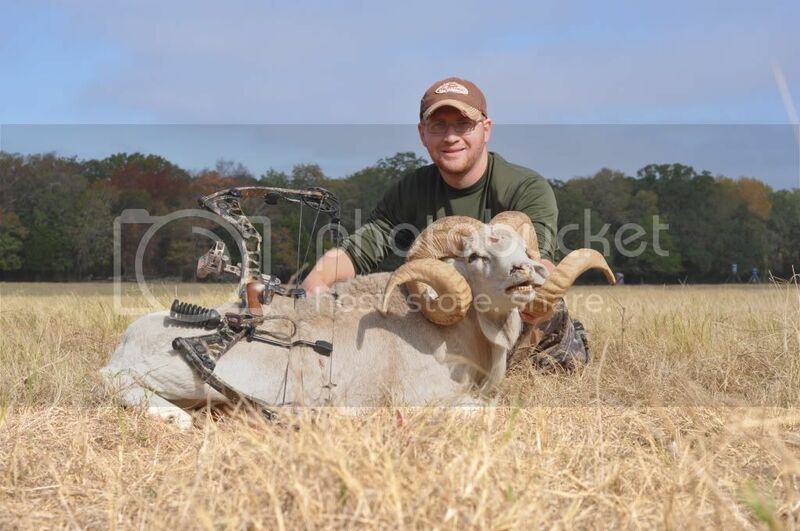 Going with my gut I settled the 30 yard pin on the narrower heavy ram and let the arrow fly. The result was impressive to say the least. The arrow entered perfect quartering away and took out the heart and lungs. The ram went less than 10 yards and died in less than 7 seconds. The video proved to be spectacular. As I walked up to the dead ram I was amazed. The mass had completly fooled me. The ram was much longer, much wider, and much much more massive than I had thought. He measure 36" on each side and had bases that taped out at ll inches and he carries his mass throughout. Score does not make a trophy but his is quite astonishing I scored him at 141 &6/8 inches which would put him at #7 all time with a bow. Overall the hunt was incredible I took 5 animals in 5 settings. The sika is 2 inches from being gold medal, the oryx is just above gold medal, and the dall is over 15 inches above gold medal. This is incredable considering the inexpensive price of hunting this ranch. I was able to capture all 5 kills on video and could not have had a better time. All impressive animals. That Texas Dall is super! Congrats! Are you going to post the videos? I will have to upload and edit them and will post them. It will probably be a few days before they are up. Thats a trip you won't forget! Now hurry up and get back to NC while we still have animals!!! This is quick edit of part of the video for the ram hunt. Nice Shot. Do you have the video from the other animals you took? Wouldn't mind seeing those as well. Congrats again. I managed to get all of my kills on film. I think they all turned out good. The oryx the only negative thing was that the first shot was low and back and I had to rush to get the second shot off and did not get the second hit. I will post the others soon. Thanks. Last edited by TravisElmore; 09-29-2011 at 12:56 PM.